We are quickly approaching spring break, during which kids could either stay home in front of the television, or join an award-winning camp. Why not challenge them a little bit during their time off? ESM Holiday Camps is a leading multi-activity camp provider for children aged 4 to12 in the UAE for the past 12 years. The holiday camp encourages children to thrive, learn and develop while making friends and having fun. They offer a balance of sports, games and creative activities, with each group and session perfectly suited to the age and ability of every child. ESM Holidays Camp, part of East Sports Management, won Gold at the 2017 Sports Industry Awards (SPIA) for Best Youth Organization or Academy. What is ESM Spring Holiday Camp? The ESM Holiday Camp is a multi-activity camp experience that is recognized by child development professionals as valuable in helping children mature socially, emotionally, intellectually, morally, and physically. The Multi-Activity Camp, perfect for kids aged 4 to 12 years, is uniquely positioned to provide developmental skills for children. The camp program is a good mix of over 16 sports activities to get the hearts pumping and indoor activities to help concentrate minds and encourage dexterity. The biggest plus of the multi-activity camps is that they help young people discover and explore their talents, interests, and values. Most schools don't satisfy all these needs. Kids who have had camp experiences at ESM Holiday Camp end up being healthier and have less problems. ESM makes sure that all the venues have great and state of the art facilities with health and safety always being the top priority. Each of the sessions are perfectly suited to the age and ability of the children. When does the spring camp take place? March 31 to April 11, so make sure you register soon. Spring Camps vary depending on how many days you select and which venue you choose. On each camp booking page, they have a pricing section that will give you real time pricing information. You can select/de-select options and watch the price change. Parents can get up to 35 per cent discount when booking online on the website. •	Add the special Gulf News discount code and you get an additional 5 per cent Discount on camp fees. What kind of sports & activities will my child take part in? The general activities which take place at most venues are as follows: Basketball, Football, Dodgeball, Fun and Games, Arts and Crafts, Mini Tennis and Aqua fun. Dependent on the venue, these additional activities will take place: Gymnastics, Martial Arts, Karate, Badminton, Quick Cricket and Rounders. A typical day starts at 9am (drop off at 8.15am) and finishes at 1.30pm (pick up 1.30 to 2pm). Although the majority of the activities are sports related, staff draw up a balanced program for each day to challenge kids physically and while they catch their breath they’ll tap into their more creative thinking with arts and crafts activities. Who will be teaching the kids? The best camp staff in the UAE. The training staff consists of the best certified coaches in the UAE. ESM hire coaching staff for their expertise and experience as well as for their dedication and the continual improvement of their coaching and teaching skills. What are the different camp locations? The conveniently located ESM Holiday Camps are now offering activities to students aged 4 to 12 making it easy for parents “on the go”. With multiple age specific activity options at hand, they can now send their younger kids with their older siblings to attend the multi-activity camp at the same time. Looking for a camp closer to home? 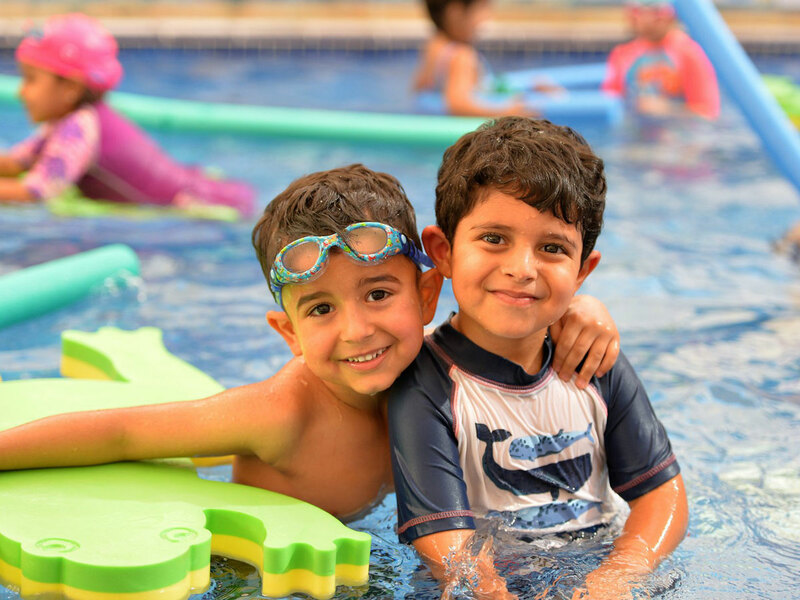 ESM Holiday Camps makes it easier for you and currently offers camp experiences across 16 venues in Dubai and Abu Dhabi. To avoid the morning rush, parents can use their door to door bus transportation to the closest venue to where they stay. Use code: SPGULF for an extra 5 per cent off!